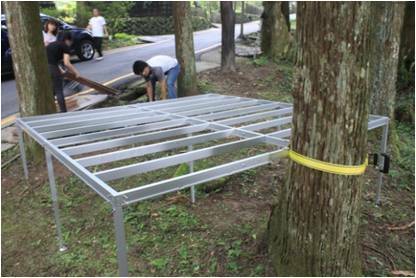 The present invention relates generally to a combined tent, and more particularly to an innovative one which allows at least a snap ring to be sleeved securely onto the vertical columnar object, such that the combined tent can be used overhead without limitation by the ground state. 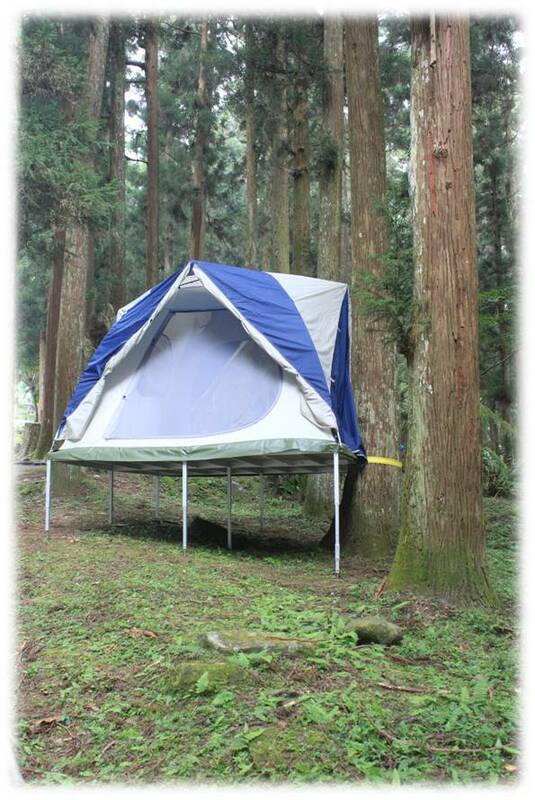 In recent years, more and more outdoor activities are welcomed by the general public, particularly the camping activities by the youth; but, conventional tents erected on the ground are limited by oblique or uneven surface during assembly, leading to discomfort against the users. As for the campers, short-terms workers in mountains, ecological observers and refugees requiring to erect tents for temporary use, it is often difficult to find out a piece of flat land, or otherwise it may take a longer time and more efforts to level up the land, leading to slow erection of tents; moreover, they have to clean up possible obstacles (including: stone, weed) on flat land, without mentioning the common concern of disturbances by snakes, insects or other small animals, etc, in the ambient environment. Thus, to overcome the aforementioned problems of the prior art, it would be an advancement if the art to provide an improved structure that can significantly improve the efficacy. 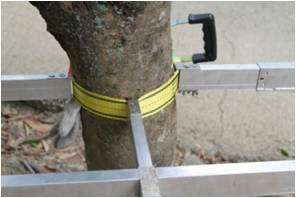 Therefore, the inventor has provided the present invention of practicability after deliberate design and evaluation based on years of experience in the production, development and design of related products. 1. 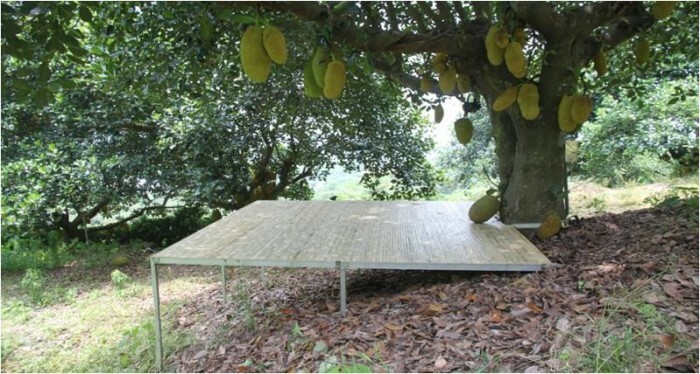 A novel, overhead tent structure is provided to the users (e.g. : campers, short-terms workers in mountains, ecological observers and refugees) as a shelter; its overhead design enables flexible erection in response to the ground state; moreover, various units can be assembled and disassembled very easily without the help of other hand tools; the disassembled units of smaller size could be carried, handled or transported conveniently; with the outstanding characteristics of the tent structure of the present invention, the users could select proper site to erect tents, where applicable, according to the weather and geographical conditions. 2. Based on the design of the overhead combined tent that the soft lining is set on the vertical columnar object, the vertical columnar object could be protected by the soft lining, e.g. : if the vertical columnar object is a tree; the overhead combined tent of the present invention can thus be erected independently of the geographical condition while minimizing the damage to the ecological environment. 3. 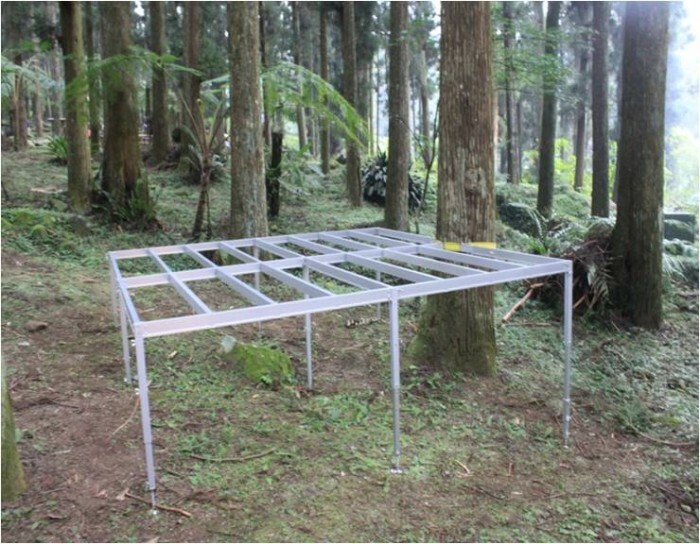 The structural design of said universal swinging footstand enables to obtain a stable erection point in tune with the slope of ground; when the tent skeleton and supporting leg assembly swing due to air stream or earthquake, the universal swinging footstand could swing in tune with the overhead structure and keep stable the pivot, thus improving greatly the resistance of the overhead combined tent to wind power and earthquake; the second advantage of said universal swinging footstand is that, a stable erection point could be obtained in tune with the slope of ground to erect smoothly said overhead combined tent. Page created at 2019-04-21 18:49:29, Patent Auction Time.